As a natural sprinter and playing quick on my feet in soccer, running long distances (anything beyond 1 mile was LONG in my book!) was difficult for me to grasp. However, after a few years of finding my groove in running a friend talked me into doing our first triathlon together — in a pool, on our mountain bikes, and through the country. Little did I know I would fall in love with competing in triathlons and would later return to bike parts of the same course while competing in my first Ironman in 2013 (my home state of Kentucky). Born and raised on a farm, my husband and I took a leap of faith and moved to St. Louis in the summer of 2010. I joined the St. Louis Triathlon Club in 2011 seeking ways to get back into the game with goals to possibly race beyond sprint triathlons. The past two years have been life-changing. I have gained friends and have been surrounded by amazing camaraderie and support. This club isn’t just about triathlons…it’s about giving to the community, motivating and mentoring others in accomplishing their goals. In fact, my first year with the club, I was encouraged to chase after my goals. That summer I finished my first Olympic and Half-Iron distance races. The following year in 2013…I finished my first Ironman. Within the Ironman, I finished my very first marathon! Two things I said I would never do nor did I have a desire to do: run a marathon or complete an Ironman. Now, my husband is on board and started running. It’s an exciting and addicting atmosphere because ANYYTHING Is possible! I love the great outdoors and triathlons, the challenge is what keeps me sane, disciplined, and something to work hard for. I look forward to spending another great year with the St. Louis Triathlon Club as a mentor and a Member At Large. What is your favorite race? 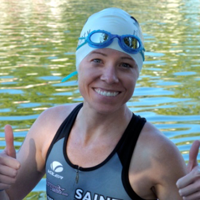 Ironman Louisville – not just because it was my first Ironman, but the course was beautiful, the finish was AMAZING, my entire family witnessed me racing a triathlon for the first time (no gradual spectating! ), it was my home state, AND part of the bike course was on the course of my very first Tri! Crossing the finish – leaves you with a whole new level of confidence. What is the most challenging moment you’ve had during a race? Despite my first tire blow at 20 miles left of the bike during my first Ironman, I faced a new level of racing…mental battles at mile 18 of the run. I didn’t know what my body was going to do since I had to walk the last 10 miles due to severe knee pain. Walking 10 miles was brutally tough but in my mind, I did not train 9 months to stop here…I was NOT giving up and kept my feet moving forward. Tip for new (and veteran) triathletes? Primary goal is to have FUN – it’s not about times in this field. It’s about playing smart and accomplishing your goals – ANYTHING is possible, so don’t give up!